One and a half hour drive through lush pine and fir forests in Kashmir Vally will lead you to some of the most exotic meadows nestling in the lap of dazzling Pir Panchal mountain range. Situated at an altitude of 3200 meters above sea level, Dodhpathri, spread over 240 square kilometers from Palmaidan to Ashtar, is considered to be the largest meadow of Kashmir valley, surrounded by Sukh Nag Nalla and Shaliganga river, which originates from Tata Kati glacier situated at 4563 meters above sea level. Three lakes - Gurwan Sar, Daman Sar and Pam Sar - enrich the awesome beauty of Dodhpathri. In the vicinity of Dodhpathri is Dumail glacier, which happens to be the source of Doodganga river. The journey to Dodhpathri is half the enchantment of reaching there. Dodpathri is a part of series of meadows starting in the East from Yusmarg and culminating in the West in Gulmarg. Prior to 1989, before the outbreak of militancy in Kashmir, Dodhpathri had witnessed a huge influx of foreign and domestic tourists, but during the past 20 years it had almost gone into oblivion. However, with the revival of tourism, tourists are again showing interest in visiting Dodhpathri. Going by the Dodhpathri Development Authority (DDA) records, 1.50 lakh tourists had visited Dodhpathri during 2003-2004. In 2004-2005, 1.6 lakh tourists had visited the place. The figure had gone up to 1.75 lakh in 2005-2006. Legend has it that once Sheikh Noor-ud-Din Noorani, popularly known as Sheikhul Alam, was in search of water to offer prayers. He pierced the ground with his stick and milk gushed out of the hole. Ever since, the place is called Dodapathri. The people here are known for their simple and hospitable nature. They live in mud huts and have adopted sheep and goat rearing as their primary occupation. 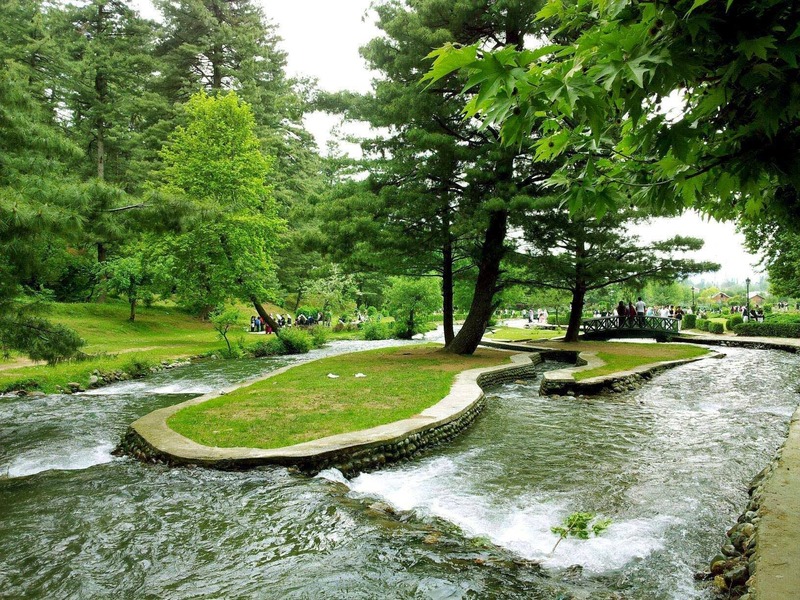 Unlike other hill resorts like Pahalgam and Gulmarg, Dodhapathri is not too far away from Srinagar city. It is situated at a distance of 50 kilometers from Srinagar, 28 kilometers from central Kashmir's Budgam district, and 12 kilometers from Khansahib. Dodhpathri is connected by road from Budgam via Arizal, Arigam, Mujpathri, Riyar Khansahib. About 40 kilometers away from Dodhpathri to the south is famous Tosamaidan, spreading out its charm over an area of about 8000 kanals. Presently, Tosamaidan and Dodpathri are cut off from each other, but both the picturesque locations can be linked through a pony track. The Poonch Gali pass on the right side of Tosamaidan leads to the valley of Poonch. Mughals used to go to Poonch via this route. This path was considered safest, easiest, and nearest to reach Punjab in the ancient times. According to historians, Mughals had constructed a seven-story building, Dam Dam, here. On the East side of Dodpathri is another large meadow, Digikhal, spread over 5000 kanals of land. In absence of vehicular road, tourists can enjoy a pony ride up to Digikhal. The DDA is mulling over an idea to install cable car from Dodpathri to Digikhal, which would enable tourists to enjoy the scenic beauty of the place. Lush green meadow covered by lofty pine trees and a magnificent view of snow capped mountain, Parihas spreads out its charm over 800 kanals of land. The Royal Springs Golf Club (RSGC) is constructing a mini golf course here. The golf course will be highest green golf course in the world, at an altitude of 3200 meters. With an aim to keep Dodhpathri pollution-free and make it Eco-friendly tourist spot, the DDA is planning to allow only eco-friendly vehicles to move beyond Parihas. The DDA has constructed a huge parking space here for the tourist vehicles. Other meadows in the vicinity of Dodhpathri include Chanz (4000 kanals), Chin Marg (3000 kanals), Tangnar (3000 kanals), Ashtar (2000 kanals), Sochal Pathri (2000 kanals), Boolay (1000 kanals), Pal Maidan (600 kanals), Sukh Nag (200 kanals). Not only is Dodhpahtri an excellent place for a holiday, it can become a favourite resort for trekkers. Tourists can go for trekking and hiking. There is a wide range of climbs to choose from. Pony riding in the meadows here is a tourist's delight. Ponies can be hired for the trip up to Digikhal.